First, let me take a moment to remember our Veterans...especially those who have paid the ultimate sacrifice for our freedom and for their families who continue to pay. These smiling faces are free to enjoy the holiday thanks to those who were willing to stand up for our freedom. And, may those serving on this Memorial Day be safe and appreciated. 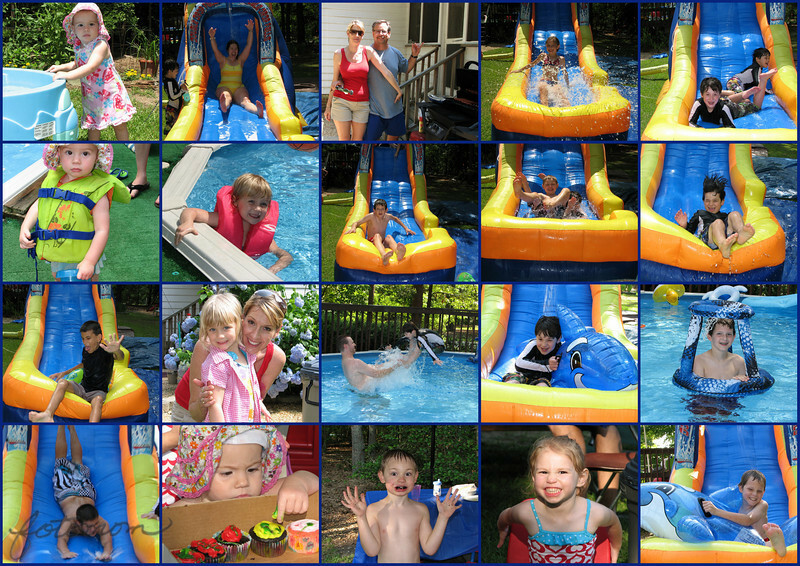 This is the 3rd year in a row we've spent Memorial Day weekend at Madi's house on the waterslide. Some of the faces change, or at least grow up, but it's mostly the same crew enjoying a wet and festive day on the slide and in the pool. I just love capturing smiling faces and making sure each person has a shot of themselves from the day to look at, enjoy, and smile upon. Although a few are not pictured, these shots are certainly a good representation of the fun that we had yesterday. Yes, I did go down the slide, and please feel very free to overlook the picture of me! I hear it's back for day #2 later today. Woo hoo! wow, lovely !! lots of fun ! Looks like a terrific party...now preserved so well! Really great collage! Lots of cute/happy faces! what a fun collage, I think the flower is just a Columbine..
Wow, looks very fun!! You are great mom and photographer! Great many shot!